I am a big proponent for booking your travel online and I stopped using travel agents decades ago. But, I also spend 12 hours a day on the internet between work and my various hobbies so I am very familiar with how things work on the internet. I create internet sites so I think like a programmer which always helps. I have written bugs in internet software and therefore I am more familiar looking for them. Not everyone has that experience which is why I appreciated an article from Chris Elliot’s blog titled The Web site ruined my trip!. “There were no roll-away beds and so I had to sleep on the floor,” she remembers. But there was a happy ending. Her online agency reimbursed her for the room. 1) Double check what you type of room the hotel is promising you. I have often used sites like Hotwire.com for instance. I usually get a room with two double beds but if you look at the site carefully you will see that they only promise me a room for 2 people. At least once I ended up sleeping on the floor while my family took the beds. That wasn’t their fault, that was mind. (It was good for my back). 2) Be aware that when something goes wrong most major travel sites will stand behind their work so let them know. I have had this happen when booking online at a hotel in Hawaii as well as when booking directly with a hotel by phone. I bring a print out of the reservation which might help because my next step is going to be to talk to the hotel manager and/or the booking site. The larger booking sites have phone numbers to call. 3) I have stood at a hotel for half an hour while the front desk person told us that we had no reservation and they had no rooms. A friend of ours calmly and persistently talked to the hotel’s reservation agents and found that they had a partial record of our reservation. Then he calmly insisted on talking to the hotel manager. It turns out that many hotels still have a room or two left when they say they have none left. 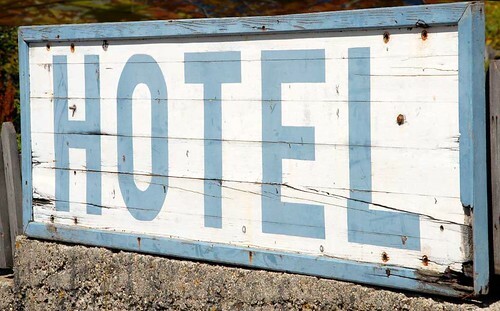 If they have no rooms and it is the hotel’s fault (they have overbooked for instance) then you should expect that they will contact a nearby hotel and pay for a room for you. 4) Hotel sites aren’t the only ones that ruin trips. So do airline sites, according to reader Robb Gordon. Always, always, always double check the details before you press purchase. I have done this before with a hotel and walked into a hotel a month before my reservation. In my case the hotel chose to honor it even though I had made the mistake. 5) In the case of the airplane ticket you probably will have to pay something to change your reservation, but that will depend on the airline (Southwest does not charge a fee). Pick up the phone and call the airline as soon as possible. Be calm and persistent. If the agent who answers will not change the reservation without a fee, see if their manager will. If not, then consider it an educational expense in the school of hard knocks and don’t forget to double check your trip details in the future. 6) If you book with a travel agent also double check the details. Where I live, in California, Travel Agents are required to have errors and omissions insurance. This covers them when they, for example, accidentally book you a day late for your tour because they forgot to account for the international date line. It happens. Hudson: I would like to book a ticket to Bermuda. Landry: Ah yes, just sent a young couple off to Bogota. Hudson: Bogota? Bogota is in Columbia. Landry: You sure? Be hearing from them. HotWire.com says "Smoker? Non-Smoker? Use Something Else"